Hanoi is, without a doubt, one of the most charming cities in all of Asia. Fondly This full-day tour takes travelers on a journey through the highlights of this bustling metropolis that’s fondly referred to as the “Paris of the East”. Explore the Ho Chi Minh Complex, Museum of Ethnology, Ngoc Son Temple and the stunning Hoan Kiem Lake. Then take an exciting cyclo tour through the Old Quarter where travelers can comb through the stalls of local markets selling handmade goods to end the day. This full-day private tour of Hanoi showcases the best of a city known as the “Paris of the East”. Travelers will kick off their morning with a stop at the Ho Chi Minh Complex, where they will get an up-close look at the former leader’s stilt-house residence, mausoleum and Presidential Palace before exploring the Ho Chi Minh Museum. Afterwards, visitors with journey to the Temple of Literature, which was constructed as an homage to the great thinker Confucius. Travelers can wander the grounds of the first university in the nation, which dates all the way back to 1070! The historic halls are lined with decorative turtle backs inscribed with the names of university graduates. Five impressive courtyards with paths once reserved for the Emperor are now open to the public. Check out the statue of Confucius in one of the courtyards and marvel at the bronze storks standing atop resting turtles meant to guard the academic. Because Ho Chi Minh Moausoleum is closed on Mondays and Fridays, travelers will tour the Hoa Lo Prison instead. Enjoy a traditional Vietnamese lunch in comfort and style before touring the Museum of Ethnology. Championed as the top museum in the country, this impressive hub of culture and history offers up plenty of information about the 54 ethnic minorities that make up this nation. From there, travelers will head to Ngoc Son Temple, located on a small island in the picturesque Hoan Kiem Lake. This striking architectural masterpiece dates back to the 13th century. Visitors will end the day on an hour-long cyclo tour through Hanoi’s Old Quarter, where an expert driver will navigate the narrow streets and back alley passes. Travelers can comb through the wares at tiny shops and quiet storefronts before returning to the hotel. It was a rainy day so we walked about in the rain. Tour was good, tour guide Van was very friendly, informative and accomodating, seeing as we had senior citizens and a newborn in the group.It was cold! 10 degrees out and light rain. Trishaw ride was fun. Lunch was superb. A great tour and a great way to see Hanoi! Tour was excellent. Tour started on time and tour guide, Long, was very knowledgeable. Driver and the included meal were excellent. We did all the visits that were listed but walked through the old quarter our choice so we could keep Long as our guide rather than taking the cyclo ride. Highly recommended tour of Hanoi. Such a great tour to see the city! Cray going in and out of all the mopeds! Great tour! Would do it again! The guides were funny and raced each other. Best way of getting around Hanoi, my favourite city and place in Vietnam. Its busy, the hotel we were staying was amazing, our tour guide was the BEST!! OMG he made Hanoi for me. I was celebrating my 50th, and everything went clock work. The weather is hot, but the people, this tour was fantastic. If I could give this a 10 star I would. The tour guide works for Buffalo Tours, is the best guide eva! Really well organised tour, great tour guide, very informative. The Cyclo ride at the end was fun, nipping through the busy back streets. We had the most wonderful tour guide, Trang. She was delightful, very attuned to the things we were interested in and went to great lengths to ensure we had a wonderful day. The Ho Chi Minh precinct was very interesting and Trang introduced us to some scrumptuous Vietnamese treats. The restaurant where we stopped for lunch was great and we enjoyed the Cyclo tour just as much. We would have loved to steal Trang so she could be our guide for our entire Vietnam adventure. My tour was excellent because of my guide, Diem. I saw everything as promised, lunch was at a great restaurant and I can really recommend this private tour. 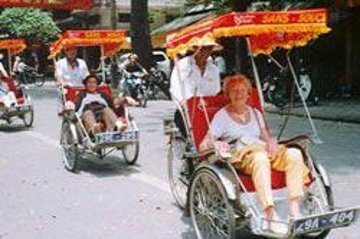 A lovely tour but be prepared for a lot of walking , nice lunch in a typical Vietnamese restaurant , finished off with a 30 minute cyclo ride through the very busy streets of Hanoi , just sit back and enjoy the ride.